With their towering trees and tiny orchids, great apes and minute insects, tropical forests are magnificent expressions of nature. Tropical forests may contain half the species on Earth, but many of those species will disappear because of continuous deforestation. More than half the original forests have already been lost, and therefore conserving tropical forests is an urgent concern for ecologists. Tropical forests include many forest types. True tropical rain forest is warm and wet, occurring mainly near the equator, where the monthly temperature never dips below 18 degrees Celsius (64 degrees Fahrenheit), rainfall exceeds 1700 millimeters (66 inches) per year, and no month gets less than 100 millimeters (almost 4 inches). Away from the equator one usually finds drier tropical forests, and on mountains one finds cooler and wetter, montane tropical forests. At sites with extreme conditions such as flooding or very poor soils, specialized tropical forests, such as mangrove, occur. True rain forest usually has 100 to 250 different tree species in 1 hectare (2.47 acres), including palms and stranglers (which germinate in a tree crown then grow up and down, eventually surrounding the host). These trees are mostly evergreen and come in many forms: with round, fluted, deeply furrowed, or spiny trunks; with swollen base or buttresses (flanges extending from lower trunk to the ground) or perched on stilt roots; with large leaves or tiny leaflets. Added to this tree diversity are other plant types: shrubs, giant vines, herbs large and small, epiphytes (plants growing on other plants and not rooted in the ground), hemi-epiphytes (which begin life as epiphytes then extend roots to the ground), lichens, and mosses. With all these kinds of plants, and with trees falling and making gaps where regrowth proliferates, the three-dimensional structure of the forest is complex. Despite the fairly uniform climate, flowering, fruiting, and leaf production are somewhat seasonal. In the other tropical forest types that are drier or cooler than true rain forest, or on extreme sites, there is more seasonal plant behavior, shorter trees, more deciduous trees, and fewer species, but plant diversity is still higher than outside the tropics. Tropical forest animals are also diverse. In Borneo there are squirrels the size of mice and squirrels 75 centimeters (29.5 inches) long. Fourteen monkey species and 230 bird species frequent 100 hectares (247 acres) of mature forest at Cocha Cashu, Peru. Eighty-six frog and toad species and fifty-three snake species inhabited Santa Cecilia, Ecuador, before that forest was destroyed. Insects are the most diverse of all; a scientist found forty-six ant species in one large Brazilian tree, as many as inhabit all of Canada. A major goal of tropical forest scientists has been to describe and explain this tropical diversity. The diversity of plants is not completely understood but is due to a combination of many factors: a long growing season; variety in growth form; specialization on particular light levels, soil types, or topography (such as slopes versus ridges); mutualisms with animals; variable conditions created by disturbances such as hurricanes; chance results of reproduction; and the tendency for common species to attract many animals to eat them, creating space for many less common ones. Moss-covered lianas in the Daintree National Park in Queensland, Australia. 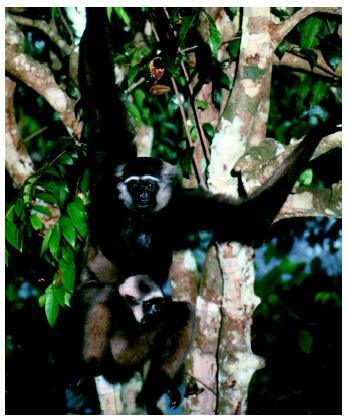 An Agile gibbon ( Hylobates agilis ) with a baby in a Borneo rain forest. Animal diversity stems mainly from specialization. Many animals specialize on the different resources provided by the great variety of plants and complex forest structure. For example, different plant species are food for different insect species, and flowers and fruit of many types support various kinds of nectar, pollen, fruit, and seed eaters, including insects, birds, bats, and monkeys. Birds catch insects in specialized ways that reflect forest structure and the activities of other species. For instance, different flycatcher species launch themselves from characteristically different perch heights to catch aerial prey; antwrens search the undersides of leaves; woodcreepers glean tree trunks; leaftossers scour the ground; hummingbirds steal prey from spider webs; and antbirds pluck insects fleeing swarming army ants. Many animals survive in tropical forest through specialized mutualisms, in which animals and plants interact for mutual benefit. This happens, for example, when insects gather nectar from individual plants of one species and transfer pollen among them. These plants often have special features to attract particular insect species. Mutualism also occurs when animals eat fruits and scatter the seeds within, promoting plant reproduction. Some plants and animals truly live together. Cecropia trees house Azteca ants within hollow stems and feed them nectar; in return the Azteca exclude leaf-eating insects and vines from the tree. Humans have inhabited and used tropical forests for millennia, but widespread deforestation only began in the late twentieth century. Forest loss varies among countries and, depending on location, results from small-scale farming, ranching, logging followed by farming, fuelwood gathering, and other causes. At many places the cleared land is used briefly before soil nutrients are exhausted, and natural reforestation is hindered by the unsuitable conditions created for trees, especially by repeated burning, which also eats into remaining forest stands. When the forest is cleared, the marvelous variety of plants and animals it contained is lost. Some can survive in small forest patches, but many cannot because light and moisture conditions are changed, critical mutualists are absent, or too few individuals of a given species are present to breed successfully. In addition to this loss of biological diversity, other consequences of tropical deforestation, depending on location, are the loss of native forest peoples, reduced rainfall, increased erosion, silting of coastal ecosystems , and possible net release of carbon dioxide and other gases that lead to global warming. Concerned with these negative effects, local, national, and international groups are trying to stem tropical forest loss. Conservation strategies range from completely protecting remaining forest to promoting sustainable economic uses that leave the forest mostly intact to reforesting degraded lands. Sustainable means using a resource in such a way that future uses are not impaired, which requires sound knowledge of tropical forest ecology. Sustainable timber harvest is one such possibility, which can succeed only if management plans are properly implemented. The success of all conservation efforts depends on ensuring that local people benefit economically, which requires strong cooperation among peoples and nations. Caulfield, Catherine. In the Rainforest. Chicago: University of Chicago Press, 1984. Forsyth, Adrian, and Ken Miyata. Tropical Nature. New York: Scribner's and Sons, 1984. Kellman, Martin, and Rosanne Tackaberry. Topical Environments: The Functioning and Management of Tropical Ecosystems. New York: Routledge, 1997. Kricher, John C. A Neotropical Companion: An Introduction to the Animals, Plants, and Ecosystems of the New World Tropics, 2nd ed. Princeton, NJ: Princeton University Press, 1999. 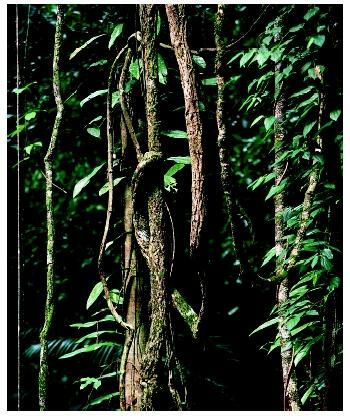 Richards, Paul W. The Tropical Rain Forest: An Ecological Study, 2nd ed. Cambridge, UK: Cambridge University Press, 1996. Terborgh, John. Diversity and the Tropical Rain Forest. New York: W. H. Freeman and Company, 1992. Whitmore, Timothy C. An Introduction to Tropical Rain Forests, 2nd ed. Oxford: Oxford University Press, 1998.